National Assembly Chairwoman Nguyen Thi Kim Ngan on April 5 hailed Belgium’s Wallonia region for choosing Vietnam as the only country in Asia to set up its representative office over the past more than two decades. During a meeting with Minister-President of Wallonia region Willy Borsus, the visiting NA Chairwoman affirmed that ties between Belgium, Wallonia and Vietnam are growing, evidenced by visits by Vietnamese high-ranking leaders. The top legislator informed the host that during her meetings with leaders of the Belgian Senate and the Chamber of Representatives, both sides were satisfied about bilateral ties and wished to boost cooperation between localities and regions as well as facilitate the exchange of visits between both sides. 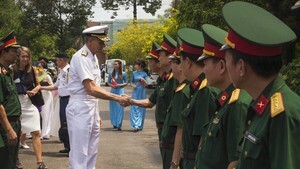 According to her, two-way trade between Vietnam and Wallonia now nears US$ 60 million. 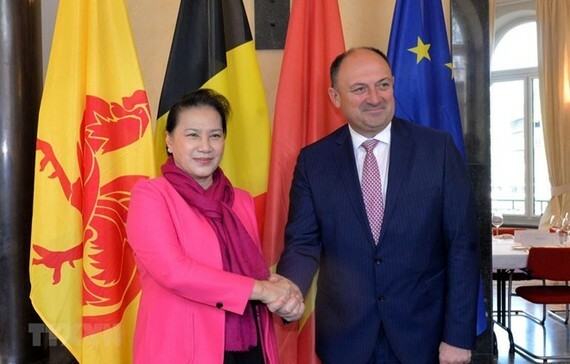 She thanked Wallonia for being one of the first three regions to submit a document to the government expressing support for the signing of the European Union – Vietnam Free Trade Agreement (EVFTA) and the Investment Protection Agreement (IPA). Ngan took the occasion to invite the host to visit Vietnam to study the prospects of partnership between Wallonia and Vietnamese localities such as Dien Bien, Da Nang and Vinh Long. Borsus, for his part, said both sides have reinforced collaboration in several areas over the past years, including in agriculture. He reaffirmed his support for the signing of the EVFTA and IPA and thanked the NA Chairwoman for speaking highly of Wallonia’s role in Vietnam. The host also accepted the invitation to visit Vietnam to enhance bilateral ties in a range of areas, especially in tourism. Leaders of Da Nang, Dien Bien and Vinh Long also took the occasion to introduce the potential of coordination in tourism, services, education-training, logistics and high-tech agriculture. Earlier the same day, Ngan visited the Medisoft company specialising in manufacturing respiratory and cardiovascular diagnosis equipment and the Gembloux Agro-Biotech under the University of Liege.